A 60 minute journey of aerobic hoop with variations of arm movements, inspiring dance music and floor work at the end. Hoopitup! Worldwide is bringing you a revolutionary way to burn calories, increase flexibility and tone the entire body. Ten minutes of vigorous cardio hooping is equivalent to jogging an eight minute mile (Depending on intensity one can burn an average of 120-125 calories). The hoop is utilized as a stretching tool to help increase range of motion in all of the major muscle groups. This non-impact aerobic activity also massages the core of the body where toxins are released, creating a toning and re-shaping of the abdominal region. Meanwhile, the arms are sustained in an isometric contraction which creates upper body strength and toning. Cardio hooping is an extraordinary way to get into shape as it incorporates all five components of physical fitness: cardiovascular, muscular endurance, strength, flexibility, and body composition. Take one of our Hoopitup! fitness classes taught by our world class instructors. We have classes for all levels. From our beginning Cardio Hoop Dance classes to our toning and shaping Hoop, Stretch, and Sculpt classes. 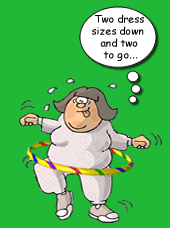 For those who want to spice it up a little try our Hoop "Hot" Latin classes. From beginner to advanced, we have a Hoopitup! class suitable for your level of fitness and expertise. Our hands on training techniques will have you hooping and grooving within minutes. Whatever level, whatever shape you're in, our instructors can work with you on a one on one basis to give you the best tips and tricks to take your hooping to the next level. Hoopitup! WorldWide takes the hoop down under. Hoopitup! WorldWide soon to head out on a multi-city tour through Texas.